So I got this module in the mail. That happened, because I have art inside it. So it was free. Let's talk about it for a second. Spoilers follow. It's by Rob Kuntz, (link goes to his extensive bibliography) one of the first employees at TSR. This module is from his later design work, being written and ran during the early 1970's. It's the fourth time this module has been in print. The first was a d20 version, the second used "Creations Unlimited" stats, the third was an expanded d20 version. The version I'm reviewing has stats compatible with 1st edition Dungeons and Dragons, which ironically makes it closer to the original. 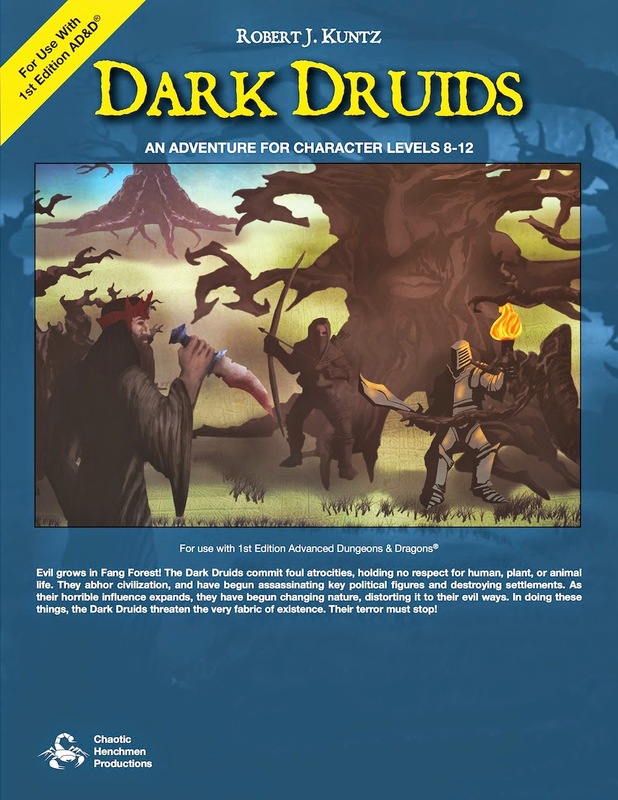 It's on the upper end of mid-level adventurers or a beginning high level adventure, for 4-8 8th-12th level players. What? Is that my art on Page 10! Sweeet! Oh, and who drew that marvelous picture of the Aboleth on page 14? Who I wonder!? The module allows for failure points as an option, with difficult puzzles. But if the players aren't smart enough to figure them out, their 8th-10th level characters should have other options for bypassing or solving the puzzles. It's written for that stage when it's ok to throw difficult encounters at the players, who are becoming well equipped to solve impossible situations. There are usually multiple approaches and solutions to any situations, with very few "gotcha's". For example, there's a living grove arena that opens for players but is misty. Alternately they can approach from above, which avoids the mist effect. There's a bunch of stuff in here: A new class (the Dark Druid), new magic items, pages of new spells, new unique monsters, a unique monster generation system, really a ton of content. It's interesting that this is the first in a series of six planned modules, with no plans for the following modules to be released. How certain are we that these won't ever see the light of day? Let's see what Robert himself has to say. Why am I so certain these will never come out? I mean, if you're going to design and intelligent culture, why not have a 15,000 word glossary? But while he's busy working on that, I don't think the sequel to Dark Druids is going to see the light of day. So, basically, this is the start of a campaign that traps your players in the underworld, cursed, with now way out, and only the vaguest outline of what comes next. You are one of two types of people. Either that is awesome or that's terrible. I think you know which one Robert thinks you should be. It's 56 pages, Saddle stitched with a loose cover. The maps are crisp, clear, functional and on the inside of the cover. There's a single interior map with several short encounters on it. The module can be punishing and was said to have killed Jim Ward's character, among others. The basic setup is that they players are sent to stop on evil cult, only to discover that there's a civil war between the two factions of the cult, making things even more dangerous. On reason there's so much new material, is that nearly every encounter is surprising, unique, or interesting in some way. A weird altar that can summon a tentamort to serve the summoner if "scabs" are removed from nearby trees and placed on the altar or a tree entirely coated in stiff jelly are the types of strangeness encountered. Some of the puzzles seem very difficult and challenging. But not wholly impossible, and any 1st edtion group that's actually played their way up to level 8 or 9 is going to have 101 tools to help them bypass those puzzles (that's over 80 sessions, at least). It isn't print on demand, and the initial print run was only 310 copies. If you'd like to get it in print, I'd suggest you do so soon. Downsides? There's boxed text. There's a long (though pretty cool) monologues introduction. It really isn't a stand alone adventure. Thanks for commenting! I loved working on the project. I referenced you, because I think that stance is pretty boss. Anyone can use it as a stand-alone module, or detail what follows on their own. I'll still be picking up one of those CD's or any of your future work if it pans out.